Cooper, in The Deerslayer, and presumably in the other Leatherstocking novels, is able to solve a problem that Walter Scott fought with his whole life. Cooper's hero, Hawkeye/ Natty Bumppo/ Deerslayer, is an interesting character. As good as Scott's novels can be, and as good as he is with creating supporting characters, his heroes are always pale, flavorless fellows. * Hawkeye is naive, idealized, and sometimes downright odd, but he has flavor. I'm having trouble finding excerptable bits to prove my case. Deerslayer is, let's say, voluble. For a stoic man of the woods, he sure talks a lot. Early on (Ch. VII), Deerslayer kills a man for the first time, a Huron chief. It's wartime, it's in self-defense, and Deerslayer does everything he can to avoid violence. So it's all right, then! Anyway, this is where he earns the name Hawkeye, bestowed on him by the dying Indian. As his victim dies, and after, and also before, Deerslayer talks, and then talks, and then talks some more. It sounds ridiculous, and Cooper even becomes embarrassed that his character talks to himself so much ("As was his practice, however, a habit gained by living so much alone in the forest, he then began again to give utterance to his thoughts and feelings aloud.") But in fact the entire encounter with his first enemy is written with a degree of tension rarely found in the novel, and Deerslayer's soliloquies and sermons lend the event substantial dignity. Deerslayer is good-humored (although never funny) but intense. He's illiterate, but full of theories about religion and culture and the "gifts" of different races. Brought up among the Delaware, he's sort of a radical multiculturalist, accepting behavior by Indians that he condemns among whites, and vice versa. In between the two cultures, he of course combines the noblest aspects of both. He'll gleefully shoot an eagle to show off his new rifle, but then feel bad that he did it. ("The sight of a dyin' and distressed creatur', even though it be only a bird, brings wholesome thoughts to a man who don't know how soon his own time may come...") He's long-winded, but he says surprising things. "Then as to churches, they are good, I suppose, else wouldn't good men uphold 'em. But they are not altogether necessary. They call 'em the temples of the Lord; but, Judith, the whole 'arth is a temple of the Lord to such as have the right mind. Neither forts nor churches make people happier of themselves. Moreover, all is contradiction in the settlements, while all is concord in the woods. Forts and churches almost always go together, and yet they're downright contradictions; churches being for peace, and forts for war. No, no - give me the strong places of the wilderness, which is the trees, and the churches, too, which are arbors raised by the hand of natur'." Hints of John Muir and Henry David Thoreau here. Also, a terrible irony, that "concord in the woods", only seen in this novel after a genocidal massacre. That's for tomorrow. * The one exception I know is The Heart of Midlothian, where the protagonist is not coincidentally female. Every writer creates his own world. The relationship between the writer's world and the real one can be tricky. Cooper set The Deerslayer on Lake Otsego, a real place, at the beginning of a real war between England and France in 1745. He spends a lot of time telling us exactly how various canoes are situated on the lake, how people are dressed, the direction of the currents. This is a realistic novel, right? Well, sometimes. But when pious, "feeble-minded" Hetty falls asleep in the woods, and is awakened by a pair of bear cubs, who, with their mother, accompany her as she walks along the shore, the novel has moved somewhere else - to Tasso's Arcadia, or The Faerie Queen. Or how about when the Lady in the Lake gives Deerslayer his famous magic rifle Killdeer? Yes, the (or a) Lady in the Lake. Yes, the rifle has a name, just like Roland's sword Durandal, or Excalibur. We're a lot closer to Morte d'Arthur and Orlando Furioso than to Lewis and Clark's Journals. The Deerslayer is Natty Bumppo's "origin" story, written last but telling readers who already know his adventures how he got the name Hawkeye, how he got his reputation, and his rifle. It's all suitably heroic. Perhaps this sounds dismissive. I don't mean that. I think it helps to know what a person is reading. Twain's complaints about violations of realism are funny but irrelevant. Cooper's world is fundamentally unreal. His American frontier is closer to the real world than that of, for example, Chateaubriand's Atala, with its hermit priests and Kentucky crocodiles. But as in Atala, the semi-real setting is used to emphasize other concerns. I'll try to pin those down tomorrow. There's been a revival of scholarly interest in Cooper lately. This article from an the NEH Humanities journal is a good place to learn about that. Cooper more or less invented the spy novel, the sailing novel, and the Western. So Cooper gives scholars interested in genre and reception a lot to work with. He's also been picked up by people interested in early environmentalism, interested in, for example, the scene in The Pioneers where a flock of passenger pigeons are slaughtered. I think this is all pretty interesting, but the there are limits to how far the non-scholarly Amateur Reader can go with this sort of thing. * Careful, son. "Romantic" is a tangled term. The Deerslayer is Romantic in that it has the qualities of the old Romance genre (Boiardo, Malory, Ariosto). It's also Romantic in that it explores or advocates post-Enlightenment ideas associated with Romanticisim. But these two definitions are only barely related. I seem to only mean the first one here. I am not normally one to suggest readers skim novels and not "encumber themselves with details" - quite the contrary, the more encumbering the better - but Cooper seems to be giving explicit permission here, just at a point when many readers are probably thinking "Forget Judith, how is Deerslayer going to escape from the Hurons." "Little did either of them imagine at the time that long ere a century had elapsed, the progress of civilization would bring even much more extraordinary and rare animals into that region, as curiosities to be gazed at by the curious, and that the particular beast about which the disputants contended would be seen laying its sides and swimming in the very sheet of water on which they had met." "The Otsego is a favorite place for the caravan keepers to let their elephants bathe. The writer has seen two at a time, since the publication of this book, swimming about in company." This is not yet a defense of Cooper, but that's pretty great. Cooper's art has some defects. "Cooper's art has some defects. In one place in 'Deerslayer,' and in the restricted space of two-thirds of a page, Cooper has scored 114 offenses against literary art out of a possible 115. It breaks the record." This is obviously not meant to be fair, exactly, but Twain does score some real hits. The Deerslayer includes the scene (Chapter IV) where six Hurons are lurking over a river on a "sapling", ready to drop onto the "ark" and attack the Deerslayer and his friends. Five of the six attackers miss the ark, splash splash splash, while the sixth is pushed off the boat by the plucky heroine. The whole scene is not as bad as Twain makes it out to be, but it's pretty stupid. When characters are speaking in Huron or Delaware, Cooper can't just tell us that. He needs some sort of preface, every time, to let us know that he's translating, "for the reader's convenience only." Thanks. There's a "feeble-minded" character. I don't want to guess how many times the word "feeble-minded" is used. Cooper is always worried that we are going to forget, through the entire 500 pages. "Yes, that was it; my mind was feeble - what people call half-witted..." This is on page 491 of the Bantam Classic. I got it. Twain again: "A work of art? It has no invention; it has no order, system, sequence, or result; it has no lifelikeness, no thrill, no stir, no seeming of reality; its characters are confusedly drawn, and by their acts and words they prove that they are not the sort of people the author claims that they are; its humor is pathetic; its pathos is funny; its conversations are -- oh! indescribable; its love-scenes odious; its English a crime against the language. Counting these out, what is left is Art. I think we must all admit that." Over the next couple of days I'll set Twain aside and see if I can make some sort of defense of The Deerslayer. The Incurable Logophile is reading Bleak House, and is surprised to discover that Dickens is funny. Ha ha ha! How could anyone not know that! I know one way. My 10th grade English class used a reader that included a massively edited Great Expectations. The editors ruthlessly excised any element that was remotely comic, as unnecessary distractions that encumbered the plot. We would have been better off with an edition that squashed the plot and kept the comic bits. No one confronted with this literary freak would have the slightest clue that Dickens was funny in any way, much less that he's one of the three or four greatest comic writers in English. I don't remember when I overcame this prejudice. I know how I did it - I read Bleak House. "Small pieces of butter grieve others. They cannot attend to conversation because of the annoyance occasioned by the habit which some people have of invariably taking more butter than they want. Have you not seen the anxious look (almost mesmeric) which such persons fix on the article? They would feel it a relief if they might bury it out of their sight by popping it into their own mouths and swallowing it down; and they are really made happy if the person on whose plate it lies unused suddenly breaks off a piece of toast (which he does not want at all) and eats up his butter. They think that this is not waste." I've never read any Gaskell aside from this hilarious passage. My ideas about Gaskell are obviously completely wrong. Where did they come from? At least I know how to correct them. This is why literary readers are always so neurotically worried about Reading the Wrong Book. It might be years, decades, before misconceptions are corrected. Anyone else have stories like this? Irrational prejudices you're willing to confess? Bad teachers you want to blame? I'm wondering how to write about Lermontov's A Hero of Our Time for the Russian Reading Challenge. It's harder than I had expected. Here, my audience is, who am I kidding, myself, although a few friendly folk stop by now and then. Who is the audience at the Russian challenge? What do they want to know? The challenges are funny things. They're mostly, I guess, motivators. A lot of the Russian readers are going after War and Peace, and the challenge can help prod them along. For others, the most useful function may be providing lists. I'm thinking of the African challenge, or the recent Japanese challenge. Don't know what to read, or where to look? Look here. I am reluctant to join too many challenges. Even quite logical ones - here's a 19th Century Women Writers challenge. Perfect for Wuthering Expectations, at least for the Wuthering part. As is the challenge to read long books. The Classical Bookworm wants us to read about natural history. She's right, we should, and in fact I just finished a literally wonderful book about the deep sea, The Deep, edited by Claire Nouvian. 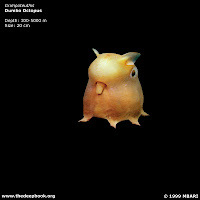 That fellow over on the left is an actual, existing animal, a dumbo octopus. I'll be checking in to all of these challenges over the next year, to see what people read, and to see how they write for each other. To see what sort of conversations develop. I don't see how any sort of discussion can get going if everyone is reading different books, but who knows. It will all be new to me. Alexis de Tocqueville was not primarily a literary critic, despite my recent notes. Instead, he wrote a founding work of modern sociology and political science. Merely. This keeps him just on the good side of philosophy. Why mince words, philosophy scares me. There won't be much of it here at Wuthering Expectations. I have the excuse that most philosophers were terrible prose writers. Non-literary. I don't read 19th century mathematicians or philologists, either. Two objections: first, a person can read about Kant and Hegel without actually reading them. Good point. I'll see what I can do. Second, aren't a number of important philosophers actually good writers? Yes, unfortunately, yes. So, who might show up here: John Stuart Mill, yes, Hegel, no. William James, yes, Charles Peirce, no way. Nietzsche, definitely, but what are The Birth of Tragedy or Twilight of the Idols if not literary criticism? Or so I tell myself. Who are the other philosophers who are within reach of the Amateur Reader? Which books? Advice much appreciated. More literary criticism from Tocqueville. Part II, Third Book, Chap 11. French novelists write - rely on - stories about married women having affairs. The reader is sympathetic to the women's behavior, because the wives are all in compulsory, loveless marriages. Americans cannot tell the same sorts of stories, because American women are in marriages of choice, so the reader has no sympathy for the bad behavior of the wives. "This is one of the causes to which must be attributed the small number of novels published in the United States." The first thing to note is that this is not true. The example of the English novel of Tocqueville's time is a sufficient counterexample - English novelists had no trouble finding subjects. But early American literature was highly imitative. Bryant was a Wordsworthian Romantic, Cooper blatantly imitated Scott, and Irving modelled himself after older writers like Addison and Steele. And these are the early Americans we consider original! For Americans, models mattered, and the French model was probably useless. So maybe this really did impose a limit on American literary creativity, or at least hackery. Is it a coincidence that the first major American adultery novel was The Scarlet Letter, a highly non-French treatment of the subject? This is so common with Tocqueville. Real insights are embedded in even his worst ideas. "The inhabitants of the United States have, then, at present, properly speaking, no literature". Pt. II, Book I, Chapter 13. Tocqueville published this in 1840, when it was no longer true. Emerson, Poe, Longfellow and Hawthorne had all published major work by this time. Dana's Two Years Before the Mast came out the same year. But Tocqueville's visit to the United States took place in 1831 and 1832. Poe and Hawthorne had published, but to no audience. The big names we still read were William Cullen Bryant, James Fennimore Cooper, Washington Irving. Bryant wrote at least one perfect poem ("To a Waterfowl") and Irving wrote at least one perfect story ("The Legend of Sleepy Hollow"), but none of these writers are quite central to US literature any more. There was certainly a lot of publishing, much of it religious and political, but also novels and poetry. Anyone who can make it through Joel Barlow's epic Columbiad, or the selected poems of Washington Allston or Philip Freneau is made of tougher stuff than I. * See the Library of America anthology, American Poetry: The Nineteenth Century, Volume 1, for mind-numbing samples. Tocqueville compares America's democratic literature to France's aristocratic literature, the mass audience to the select. He has a real insight - what America (or democracies in general) lose in refinement will be made up in volume. In other words, even if a massive amount of trash is produced, there will also occasionally be writers as good as Racine or Voltaire, just as a matter of probability. This seems pretty canny to me. I am not sure what Tocqueville means when he talks about aristocratic literature - my guess is the 17th century classics like Racine and Corneille, but he never says. While he is in America, while he is writing Democracy in America, there is a real boom period in French literature and theater - Balzac, Hugo, de Musset, de Vigny. These writers, certainly vulgar Balzac, must be part of the democratization of French literature, part of the same phenomenon Tocqueville sees in America. * Barlow's "Advice to a Raven in Russia" is actually pretty great. A last little vacation post. Central Vienna has a lot of streets named after writers and composers. I'm just glancing at a map - there's Gottfried Keller, Grimmelshausen, Grillparzer, Schiller, Goethe. Over here is a cluster of philosophers - Hegel, Schelling, Fichte, along with Pestalozzi. Vienna is saturated in Mozart and Waltzing Strauss kitsch. But near the opera house, we also see streets named after Schubert, Mahler, Bruckner, Liszt, Lehár. Opera fans will enjoy a stroll down Nibelungengasse and Papagenogasse. The only visual artist I see memorialized with a street name is Canova. I'm probably missing some. The street named after Mahler (the Bruckner and Keller streets, too) suggest that much of this naming was done, at the earliest, at the beginning of the 20th century. This was around the same time that, in Chicago, ethnic civic groups were installing statues in Lincoln Park honoring Hans Christian Andersen, Shakespeare, and Goethe. The Goethe memorial is actually a statue of the legendary hero Siegfried, along with a big eagle, which as far as I know has nothing specifically to do with Goethe, but that's no matter. Everything has a history, even the naming of streets. To the extent that I have a point here, that's it. Also, American city planners working on new exurbs near Phoenix or Denver or wherever the new cities are appearing now should name a bunch of streets after Louisa May Alcott and Charles Ives and Henry James. German literary culture is healthy, lively, worthy of our envy. This is a vague concept, I know, and I don't want to exaggerate. A big German bookstore looks a lot like a Borders, and the bestseller lists look a lot like ours, all thrillers and other Krimi novels. The New Republic recently had a cover and a couple of articles about the American "crisis in book reviewing". I'd link to it if it were worth reading. They should have pointed to Germany - there's a lot more serious book reviewing in a lot more newspapers. There's also a German-language magazine, Literaturen, that's like The Atlantic, except devoted entirely to literature. Pretty great. I don't think we have anything like it. Here's a funny example of what I mean from Austria. In a way this is cheating. Austria only has a population of 8 million or so. So the standards for being a celebrity are a little different there than here. Still, what a shock to see, on the cover (the cover!) of Austrian tabloids (tabloids! ), teasers for reviews of Peter Handke's new novel. Handke was once, probably no longer, a likely Nobel Prize-winner. But he is also a genuine avant gardist, with no interest in any sort of mass audience. It's not like seeing The New York Post announce a review of the new Phillip Roth novel. More like the Post reviewing Walter Abish or William Gass. Even funnier, in a way, was the tabloid Heute featuring, again on the cover, juicy, shocking details from the tell-all memoir of an ex-girlfriend of Handke. * I don't mean to make light of this, but it made me wonder exactly what Roth or Cormac McCarthy would have to do to make the cover of the Daily News. ** Update: I did not understand it, but I was close enough for my point, so I'll leave it as is. How old is a city? Americans have an idea that Europe is impossibly old. I went to Epiphany Mass (to hear Schubert's Mass in B Major) in the Salzburg Cathedral, which is a 1959 reconstruction of a 1628 Baroque masterpiece, replacing the original church from 774, which itself may very well have been built on an older Roman or Celtic religious site. That number 774 can be powerfully distracting. But 1959 is important, too. The Salzburg Old City, inhabited since prehistoric times (that's pretty old! ), is dominated by a dramatic crag with a medieval fortress at one end and what anyone could guess is a museum of contemporary art at the other. Salzburg is a lovely reconstructed tourist town, easily worth a stay of several days. I'm just saying that sometime it was a little hard to know just what I was looking at. In the architecture chapter of Notre Dame de Paris, Victor Hugo, in 1830, laments the destruction of medieval Paris, which he recreates in the novel. Only a few monuments were left, and when Hugo was writing, even those, even Notre Dame, were wrecks. Not to mention Roman Paris, or Celtic Paris, gone with almost no trace. * Note that this is all before Hausmann's massive modernization, laying out the parks and boulevards and train stations. Paris as it exists now is really a 19th century city. I felt the same way about Vienna and to some degree about Munich. Their current layout really dates fom the 19th century - those central train stations required a lot of demolition and urban renewal. The feel of these cities is greatly complicated by their destruction in World War II. Even some of the oldest buildings are substantially rebuilt. And some of the old buildings aren't that old at all - the Alte Pinakothek in Munich (1836), or the glorious Kunsthistorisches Museum (1888),** are contemporaries of the Metropolitan Museum of Art (1872) and the Art Institute of Chicago (1892). Museums, like train stations, are 19th century phenomena. This is all impressionistic enough that I sympathize with anyone who thinks its nonsense. *** I'm interested in how others have felt about cities they have visited. * One Sunday morning, wandering around in the Latin Quarter, I was startled to find myself in the center of a tiny Roman amphitheater, now the center of a little park. ** Really, such a beautiful museum, even aside from its contents, which include a room of Breughels that is surely one of the great museum galleries in the world. *** I could add this caveat to every post. The story, the adaptation, of The Sorrows of Young Werther was unbelievable, a disgrace, the creation of someone who apparently actively hated Goethe’s story and wanted to destroy it. A bizarre and inappropriate Christmas theme runs through the entire opera. Charlotte is given a younger sister who has a crush on Werther. And the entire last act is the final meeting between Werther and Charlotte, after (after!) Werther has fatally shot himself. That last act is a travesty, really. But that last act (most of the previous act as well), a long duet between the two leads, was also a sort of pure flow of song that was basically as beautiful as any opera I know. I was best off ignoring the subject, ignoring the words entirely, just luxuriating in the singing. Werther was sung by the young Spaniard Rolando Villazón. He was not the most forceful tenor I’ve ever heard, but he had an amazing clarity, a perfect tone. The Viennese audience applauded him as soon as he came to the fore of the stage, before he had sung a note, which I found weird, but he’d earned the applause by the end. Sophie Koch was Charlotte, almost as good. Opera fans put up with a lot of nonsense. Maybe that’s true of fans of anything, 19th century literature included. *In general, Vienna felt genuinely elegant. So I can’t explain this lapse. All week, notes from my vacation. Munich is a first rate museum city. The Alte Pinakothek (Old Painting Museum) in particular is filled with shockingly great things – the Dürers, the Altdorfers, the Rubens. But every visitor goes there, so I won’t say any more about it. I want to single out a place that is more likely to be neglected. Lenbachhaus is the villa of a successful 19th century Munich portrait painter (he painted Bismarck I don’t remember how many times) who was also a great patron of Munich artists. The villa has kept a few of Lenbach’s own rooms intact, but has otherwise been turned into a gallery for modern Munich artists. The highlights are Lovis Corinth and the whole “Blue Rider” group - Wassily Kandinsky, Gabrielle Münter, Franz Marc, Alexei Jawlensky, August Macke, and others, who in a few years in the early 20th century produced a shocking amount of marvellous, original work. The quality of the paintings is extremely high. There’s also a contemporary wing, presumably not at all full of piles of junk that would make a person despair of the state of today’s art. On this visit, I didn’t check. Each artist gets a room or two. 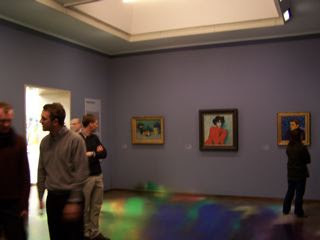 The photos here are of the Jawlensky room, from two angles. Nothing wrong with the camera - this is what it actually looks like. 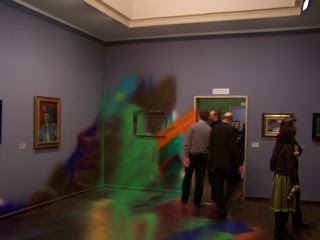 I don't want every museum to look like this, but the Lenbachhaus galleries look great. Art history - any history - is an act of story telling, and some stories are more powerful than others. There has been a sort of unidirectional narrative in art history that slights these painters. They're lumped into German Expressionism, Kandinsky is given extra credit for inventing abstract painting, and then the story moves on. The older Corinth is completely ignored. The old arrangement of the Museum of Modern Art is an example of what I’m talking about – a powerful, progressive story of how we got from post-Impressionism to the present day. Walking through the galleries was like an art history course. It was a great story, clear and dramatic. But it was sort of the trunk of the tree, with all the branches lopped off. I think this is changing. Art historians are casting their nets wider. MOMAs new gallery arrangement is more complicated, less coherent. The paintings are as good as ever. Now there's more room for Franz Marc, Gabrielle Münter, and their colleagues. Anyway, if you’re in Munich and you have any interest in painting, go to Lenbachhaus. Your guidebook that lumps it in with other miscellaneous attractions is wrong. It also has a nice coffee shop. I'm still too groggy to write anything coherent, but I'm back from vacation. Next week, you can expect posts on Munich museums, Vienna operas, and some possibly misguided thoughts on the youth and age of cities. And soon, something on Alexis de Tocqueville, and Lermontov's A Hero of Our Time. I can't speak for you, but I can hardly wait.